My go-to recipe for muffins these days is Matt Stone’s wonderful Greenhouse muffin recipe, blogged here. His book The Natural Cook Maximum Taste Zero Waste is one of my favourite reference cookbooks at the moment. This recipe works well, as Matt suggests letting the mixture sit in the fridge overnight to let the flour hydrate and the flavours deepen. The resulting texture and taste are exceptional! I’m experimenting with different flavours for this recipe. 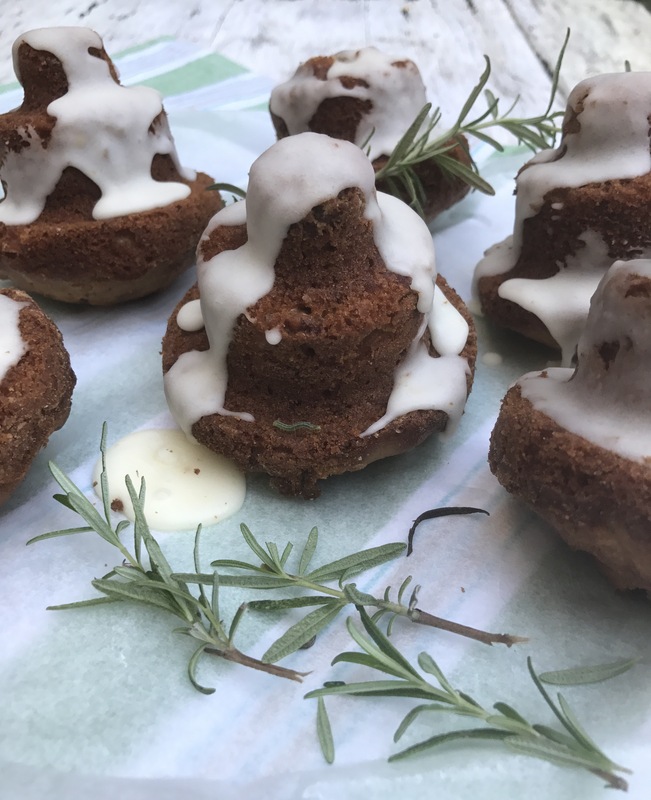 This recipe features rosemary, a fragrant woody herb, which gives the muffins a lovely intense aromatic flavour. I’ve used apples, and lots of cinnamon and ground ginger. 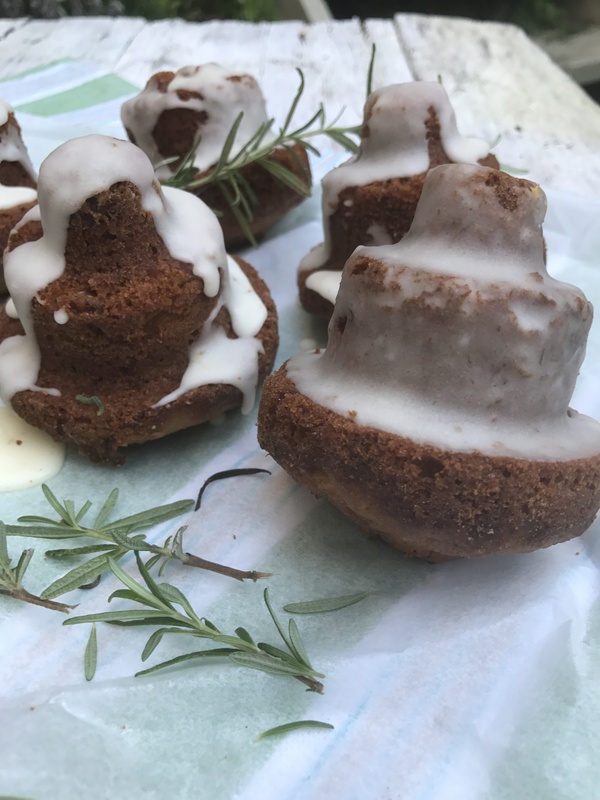 I drizzled the muffins with a lemon icing, which complements the rosemary beautifully. Pre-heat the oven to 160 degrees fan-forced 180 degrees non fan-forced. Whisk the eggs together in a large mixing bowl and once things start to get foamy, slowly begin to pour in the sugar. Keep whisking until the sugar has dissolved and the mixture has doubled in size. Whisk in the apple, oil and chopped rosemary. Use a spatula to gently fold in the flour, baking powder, cinnamon, ginger and salt. The mixture can be baked straight away, but Matt suggests leaving it in the fridge overnight. This will give the flour a chance to hydrate and the baking powder to activate, resulting in a more consistent muffin texture. The mix will keep for 3–4 days in the fridge too. Grease a 12-hole standard muffin tin and line the holes with squares of baking paper. Spoon in the muffin mixture and press it down to the level of the tin. 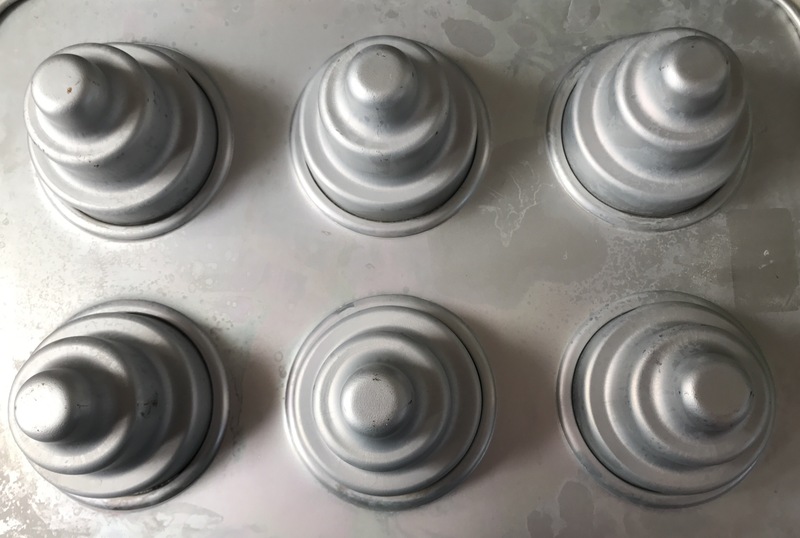 I used my fancy new Silverwood molds instead – available pretty easily in the UK, but if you’re in Australia like me, you will need to go to Blackwood Lane in Melbourne to buy them. If you want to use a fancy mold, my advice is to butter and flour very carefully to avoid the muffins sticking. I actually butter the molds, stick in the fridge for 10 minutes, then butter again, and finally flour. Place the tray in the oven and cook for about 20 minutes, checking with a skewer to see if the muffins are cooked. Once cooked, remove the muffins from the oven and leave to cool in the tin for 5–10 minutes. Remove them from the tin, peel off the baking paper and place on a wire rack to cool completely. To make the lemon glaze, mix the lemon juice with enough icing sugar to achieve the desired consistency. Spoon the lemon glaze over the muffins, allowing a little to drop down the sides. Posted in Muffins, Small Baked Things, Sweet Food and tagged apples, dessert, Greenhouse, lemon, Matt Stone, rosemary. Bookmark the permalink. Here is another way to vary the basic cupcake recipe. 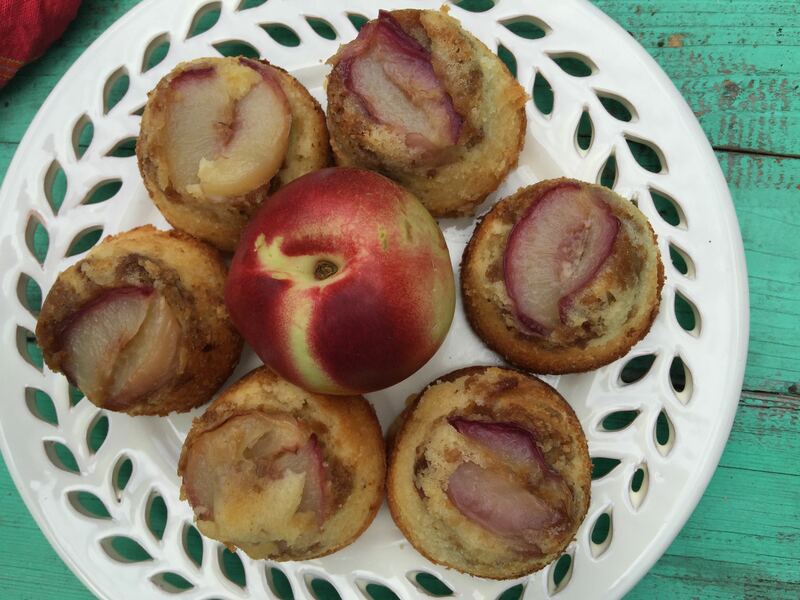 I made some mini upside down cakes, placing some nectarine slices in the bottom of my silicon muffin molds. I sprinkled a spoonful of ginger nut crumble over the fruit then topped up with the cake mixture. For this recipe I used half self-raising flour and half ground almonds. They were very moist, fruity and the crumble added crunch. The little cakes turned out well, helped by lining the base of each mold with a little disc of baking paper. This recipe makes 6 muffin sized cakes. Preheat the oven to 180 degrees C or 160 degrees C fanforced. Spray the molds with baking spray unless you are using silicon molds. Cut 6 discs of baking paper and line the muffin molds. 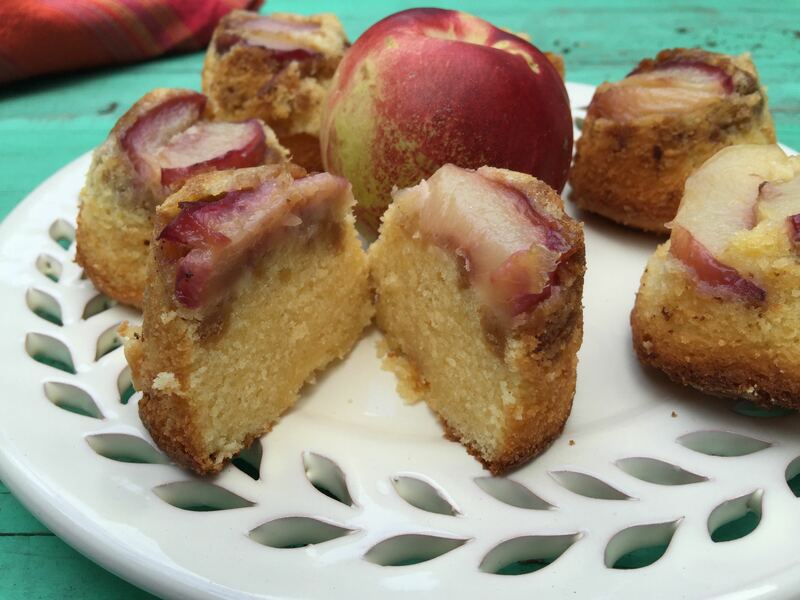 Slice the nectarine finely and place a couple of slices onto the baking paper in each mold. Bash the ginger nuts into crumbs, and rub in the flour, sugar and butter to make the crumble. Divide the crumble mixture between the 6 molds, sprinkling on top of the nectarine slices. Put the rest of the ingredients into the food processor except the milk and blitz till smooth. Add the milk while pulsing to make a soft, dropping consistency. Spoon the mixture into the molds. Place the molds into the oven and bake for 12-15 minutes or until the cakes are cooked and a skewer inserted in the centre comes out clean. Cool the cakes for 5 minutes. Loosen each cake by running a knife around the sides of the mold. Carefully invert the molds onto a serving plate. Remove the paper discs. 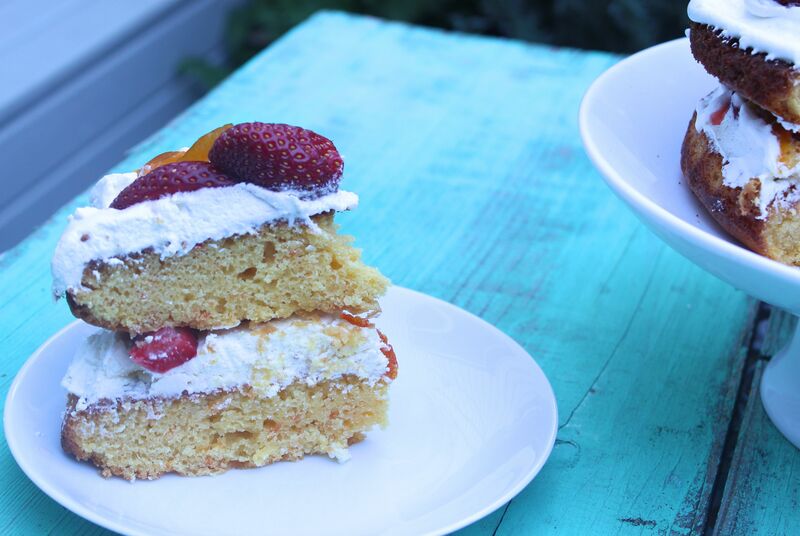 The fruit should be intact on top of each cake. If the cakes have risen unevenly, you can trim the bottom (the original top of the cake) to make them sit straight. Serve as is for afternoon tea, or with cream as a dessert. Posted in Muffins, Small Baked Things, Sweet Food and tagged afternoon tea, crumble, dessert, ginger nuts, ground almonds, peach, plum. Bookmark the permalink. This is a versatile recipe as it can be made in different sizes, served as a dessert or just as a treat. It’s quite easy to make – another food processor mixture which I love! The most time consuming aspect is soaking the raisins beforehand. Place the raisins into a bowl with the muscat and leave to soak for at least an hour. 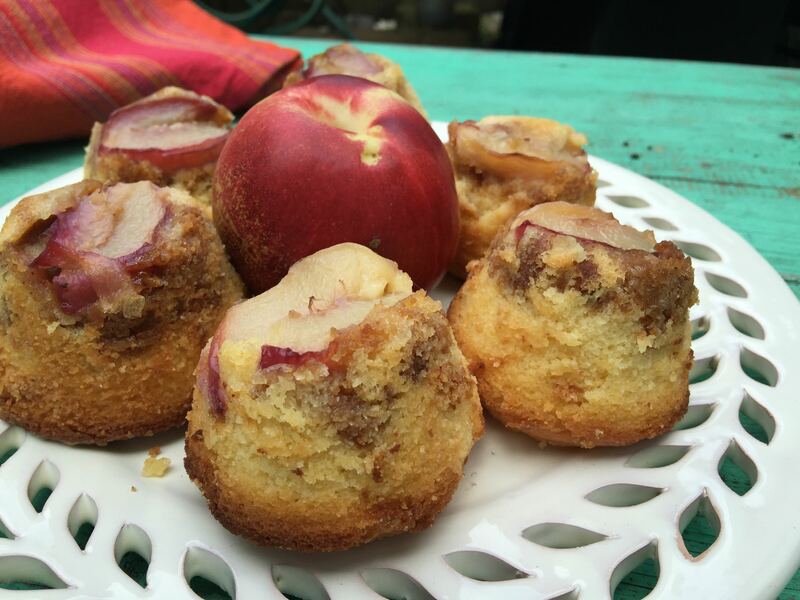 Preheat the oven to 170 degrees C. For small cakes, grease a muffin tin. Or, for a larger cake, grease a 20cm round cake tin. I happened to have a small square tin on hand, so I used that, as well filling the remainder of the mixture into muffin molds. 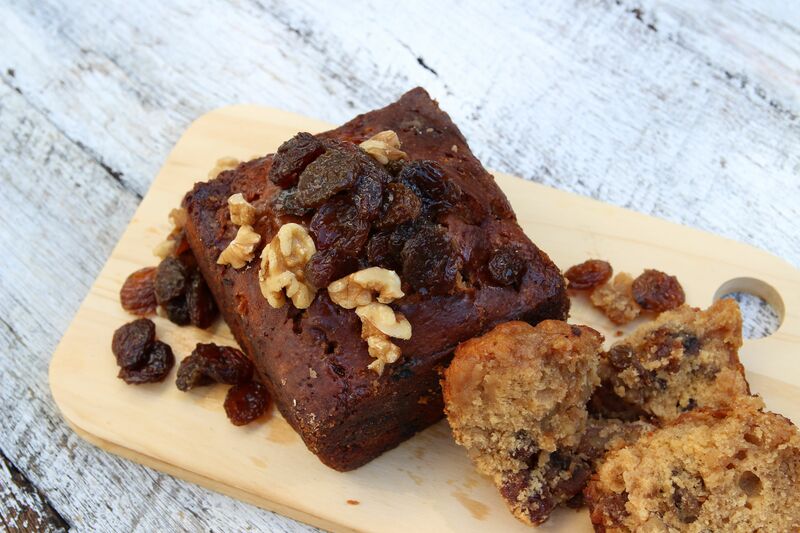 Put all the ingredients except raisins, muscat and walnuts in a food processor and blitz till smooth. Carefully fold the raisins and muscat and then the walnuts into the mixture. If the mixture looks too wet or sloppy, add a tablespoon or two more of flour. Spoon mixture into the muffin tin or cake tins. Tap lightly to settle the mixture. 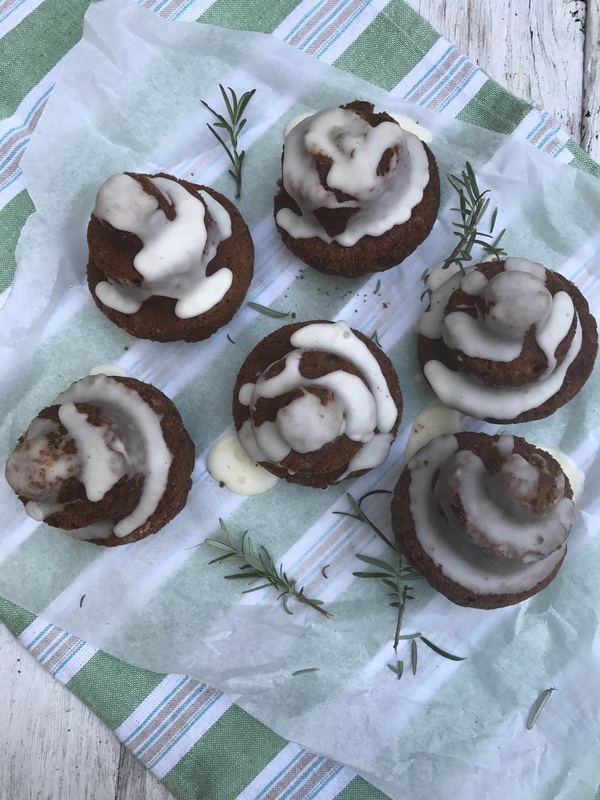 Place the tin/s in the oven and bake for 20 minutes for muffins, 35-4o minutes for the round cake tin or until the muffin/cakes are cooked and a skewer inserted in the centre comes out clean. I cannot be more precise than this as the mixture has a lot of liquid and it’s difficult to judge exact cooking times. Meanwhile, to make the syrup, put the sugar and water in a heavy based saucepan, stirring until dissolved. Then boil for 5 minutes without stirring or until the the syrup has reduced to stickiness but not toffee. Take off the heat and add the muscat. Remove the muffins/cake from the oven and pierce all over with a skewer. Pour over the hot syrup. Cool the muffins/cake in the tin/tins. Turn out carefully as the the cakes can be quite fragile with the infused syrup. 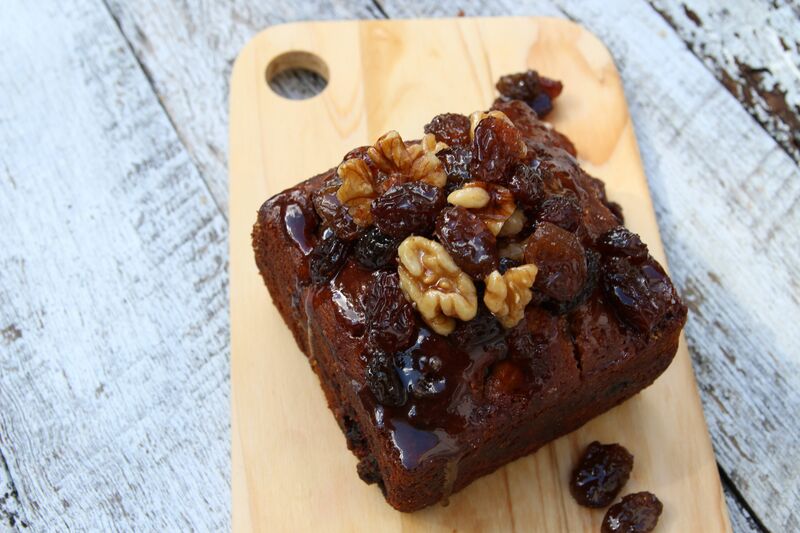 Serve with a scattering of raisins and walnuts in any left over syrup. Posted in Cakes, Dessert, Muffins, Small Baked Things, Sweet Food and tagged afternoon tea, dessert, food processor, muffins, muscat, raisins, sweet treats, walnuts. Bookmark the permalink. 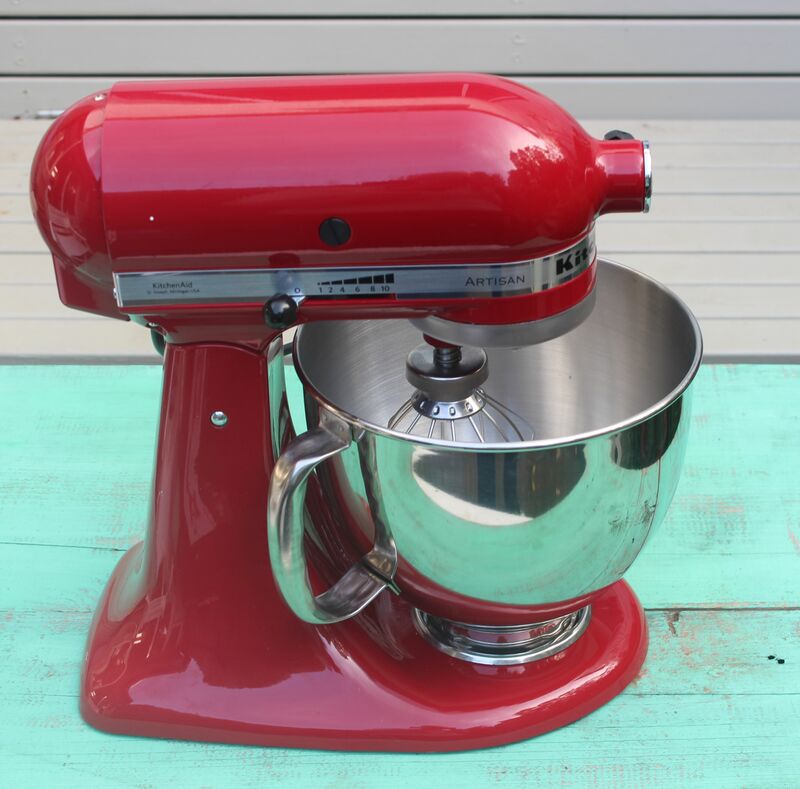 I am now the proud owner of a Kitchenaid! It’s scarlet red, very shiny and lovely to look at. And SO easy to use. A gift from my friends for a special birthday, organized by Mlle X. So this was Kitchenaid christening weekend. I’m a devotee of The Great British Bakeoff http://www.bbc.co.uk/programmes/b013pqnm. After watching an episode I just have to bake. The cake is loosely based on a recipe from that program by Mary Berry. I substituted whole mandarins plus some marmalade for the all-marmalade version. 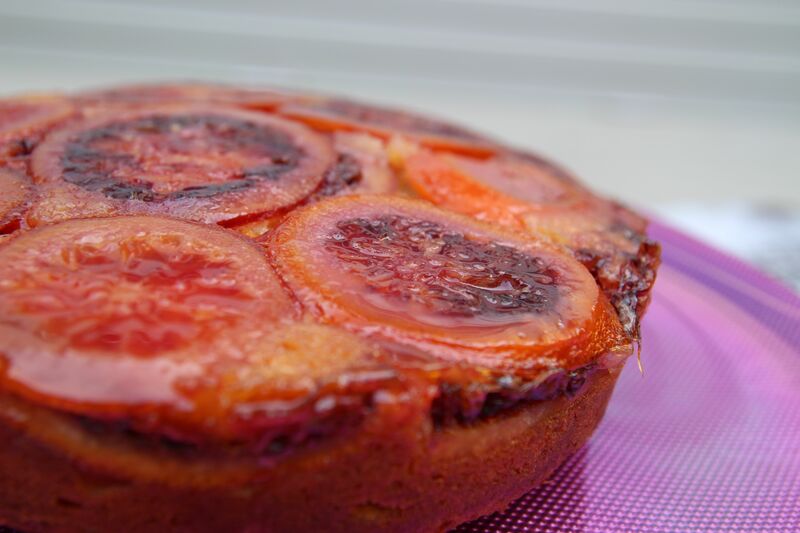 The cake is not for the fainted hearted, as it is dense and fruity and quite heavy. I think I would make the all-marmalade version next time. The equal quantities of butter to sugar made it a little rich, so maybe a little less butter would lighten it too. 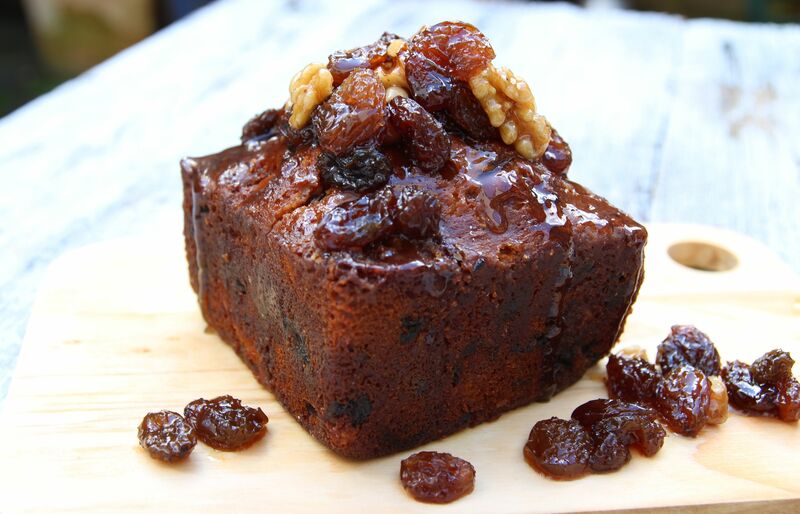 But if you want a dense and flavourful cake, you certainly achieve that here. I filled and iced the cake with meringue buttercream. The Kitchenaid produced a stunning result! Mega rich! Preheat the oven to 170 degrees C. Butter two 20 cm round cake tins and line with baking paper. Butter the paper. 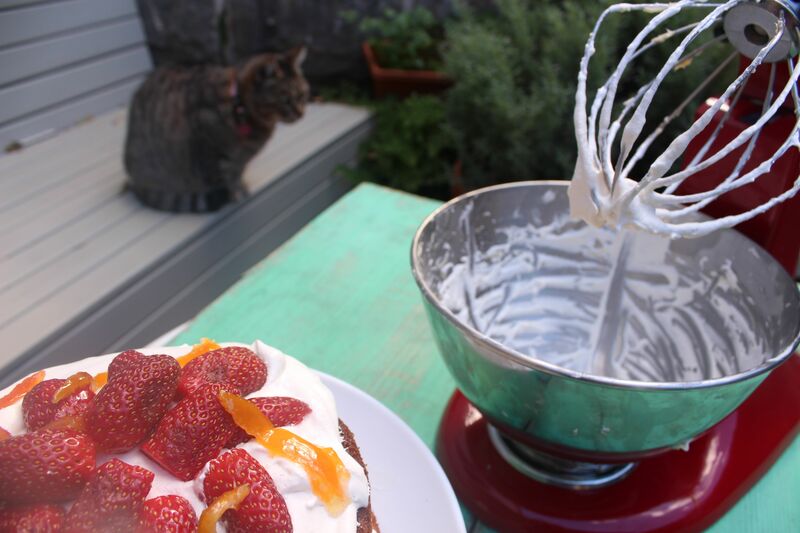 Cream the softened butter with a Kitchenaid or similar mixer until soft and creamy. Beat in the sugar gradually, then continue to beat until it becomes pale and fluffy. Gradually beat in the eggs, beating well after each addition.Sift the flour and baking powder into the bowl and gently fold into the mixture with a large metal spoon. When thoroughly combined, stir in the blitzed mandarins, marmalade and milk. Spoon the mixture into the prepared tins and spread evenly. Bake for about 45 minutes, or until golden brown and and a skewer inserted in the cakes comes out clean. Run a round bladed knife around the inside of the tin to loosen and then carefully turn the cakes out onto a wire rack. Flip to right side up. Allow the cakes to cool completely before filling and icing. Place the egg whites and sugar into a metal bowl and set over a saucepan filled with about 5 cms of simmering water. Heat, stirring frequently, until the temperature of the egg whites reaches 60 degrees C. Transfer the heated egg whites and sugar to a large mixing bowl or stand mixer. Mix at high speed until they have reached their maximum volume, 5 to 10 minutes. Mix on medium or medium-high speed while pinching off small pieces of butter and throwing them in. Mix in vanilla. Continue beating for about 5 minutes until the meringue and butter mixture is completely amalgamated, thick and of frosting consistency. 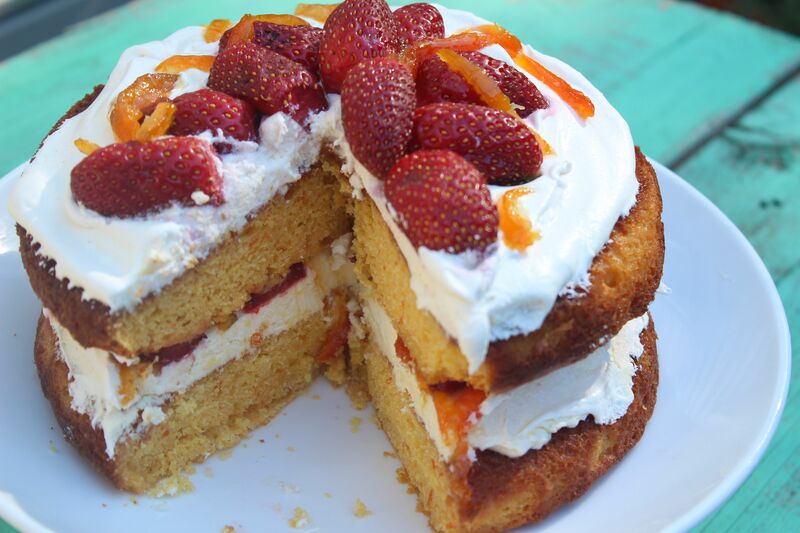 Spread one of the cakes, thickly, with half the buttercream using a palette knife. 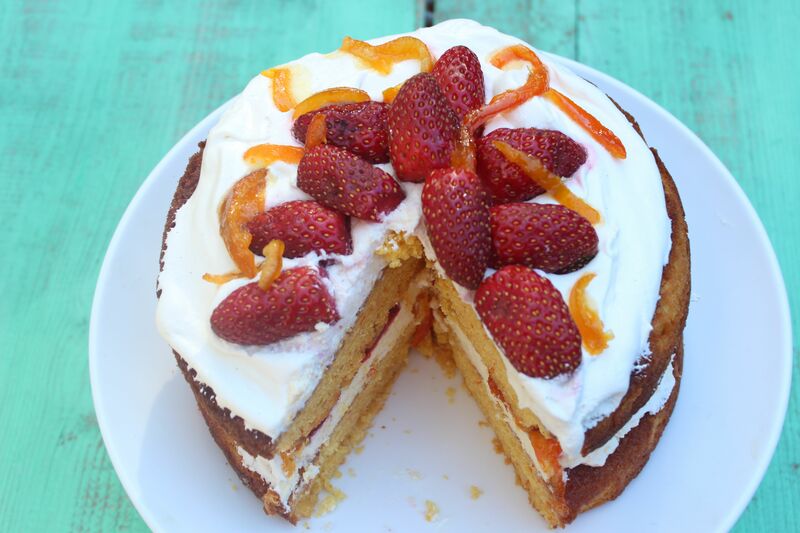 top with sliced strawberries or other scarlet fruit, and a little fruit from any good marmalade. 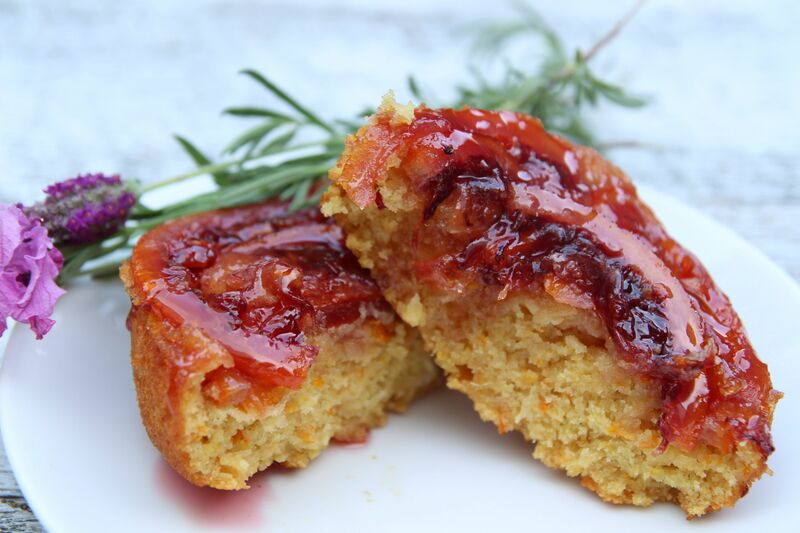 I used my homemade mandarin marmalade. Top with the remaining cake, ice with the remaining buttercream, and decorate with berries and marmalade fruit as you fancy! 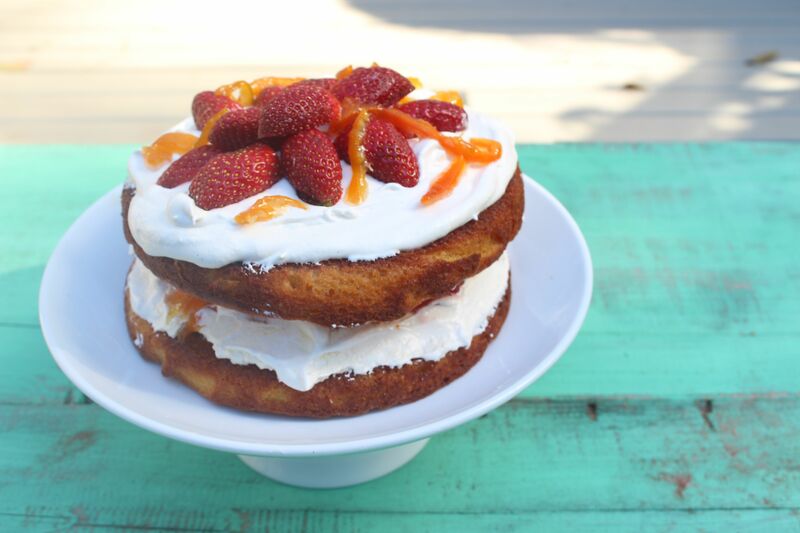 Posted in Cakes, Dessert, Jams, Marmalades, Conserves and Chutneys, Meringues, Sweet Food and tagged afternoon tea, dessert, Kitchenaid, mandarins, meringue buttercream, Seville orange marmalade. Bookmark the permalink.